I am a big fan of self-improvement. "That which does not grow is dead," I say. So I keep trying to grow in various ways in an attempt to improve my life and the lives of those around me. Cuisine, AKA cooking, is one way in which I am trying to improve. 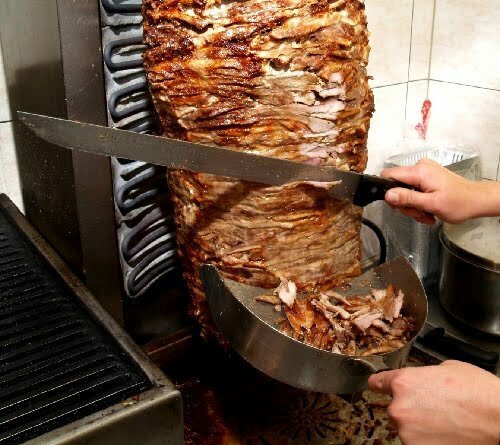 Upon a lot of reflection, I realize the best way I can do this is to purchase a lamb-filled spit, install it in my home and have gyros available at all times. At first, I thought some slight adjustments to my cooking - new recipes, different spices, fresh combinations - might be in order. But all that subtle mumbo jumbo could not possibly offer me and my neighborhood constant gyros. 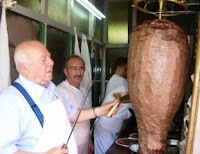 Why is it is so rare to see other meat on an enormous spit? Well, obviously, other meat remains technologically unadvanced while lamb meat has boldly entered the 21st century. Of course, a skeptic might say that a twirling spit of succulent lamb meat at home is impractical. Well, those skeptics always have a way of seeing the negative. Hopefully, I will soon have a gyro spit in my kitchen, and I will be carving my way to true happiness. I like this idea. Let me know when it's installed, I'll bring over some peta bread.